Large shrubs and small trees are always a versatile addition to a garden; they can break up open spaces, provide shade for smaller plants, act as a focal point to draw attention to your property’s most beautiful features and much more. There’s a huge range to choose from, of course, and it can be difficult to find exactly the right one to suit your purposes. 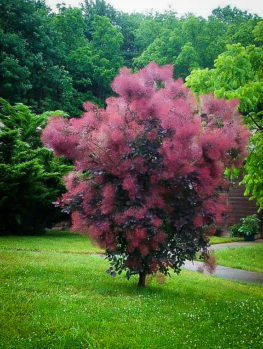 One that should definitely make it to your shortlist is the Smoke Tree, Cotinus coggygria; a loose, spreading shrubby tree that offers spectacular foliage, it can really add a touch of class and interest to your garden. 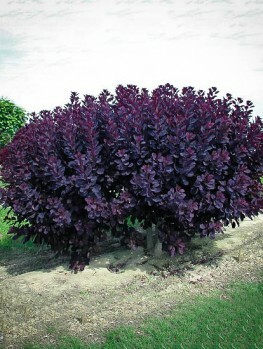 The “Grace” variety is a particularly good choice, with its vivid foliage that starts out a bright red and slowly darkens to a striking burgundy as spring turns to summer. Midsummer is greeted with a spectacular floral display and the fall colors of this tree will delight everyone who sees it. Shrubs and small trees are an essential element of any garden if you want to avoid it looking flat and two-dimensional. They help add texture to open spaces, lift your design from the ground into the air and naturally draw the eye to where you want viewers to look. Then there’s fall to consider, when many deciduous trees put on a magnificent display of color before shedding their leaves for the winter. If you pick the right one you can also enjoy the spectacle of magnificent flowers in spring or summer. 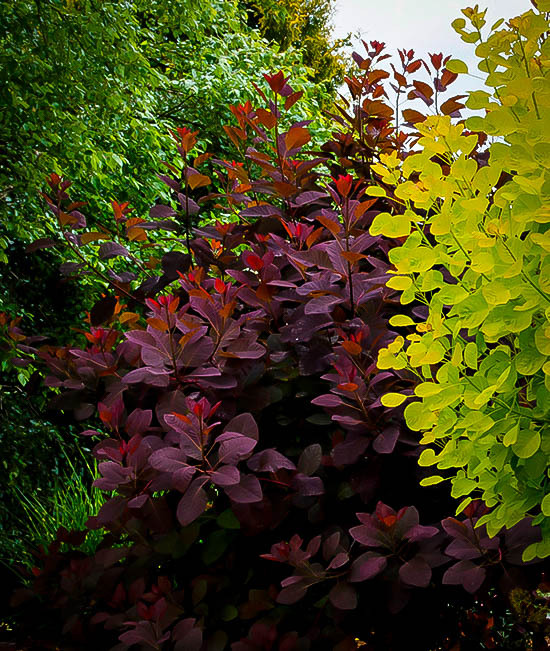 On all these counts, the Smoke Tree (Cotinus coggygria) is an excellent choice; many varieties are a manageable size for even a smaller garden and they have particularly vivid coloring and blooms. Various species of Smoke Tree can be found throughout the northern hemisphere, almost anywhere the climate is temperate. Cotinus coggygria is a Eurasian species that occurs from southern Europe all the way through to China, while Cotinus obovatus is native to the southeastern USA. Luckily for gardeners, these species can be easily crossed and this has resulted in many splendid varieties. If you’re looking for a particularly impressive Smoke Tree, the “Grace” cultivar is one you definitely need to consider. It incorporates the form of the Eurasian species with the larger size and fall colors of the American one to create a truly spectacular tree. The Grace variety grows to a height of between 10 and 15 feet when fully mature and has a loose, spreading form; it can easily reach a width of 15 to 20 feet. It’s not the size it’s most notable for; it’s the foliage. When new leaves appear in spring they’re a bright red color, which gradually turns to a richer, darker color as the weather warms. The leaves themselves have a delicate appearance, ovoid and up to three inches long. From May to July the gorgeous leaves are joined by a profuse display of yellow flowers which turn to puffy, deep pink plumes as they mature. The final treat it has in store becomes obvious in fall as the leaves change color one last time, brightening your garden with a stunning explosion of orange, gold, purple and red. This beautiful tree is highly versatile and has many uses for the gardener. Its appearance makes it perfect as an accent plant, and thanks to its size and ability to handle hard pruning it can also be turned into a very attractive hedge or screen. 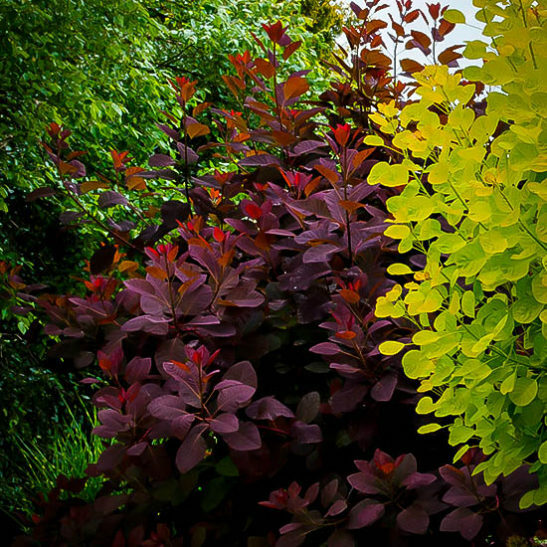 Its foliage and late flowering make it an extremely good way to maintain color in your garden through the period between spring blooms and the glory of fall. Between the flowers themselves and the plumes – which appear like smoke from a distance, giving the tree its name – it will keep things bright for two months or more while other shrubs drowse in the heat. Grace is very much a temperate tree and should do well almost anywhere in USDA plant hardiness zones 4 to 8. That makes it suitable for most of the central USA with the exception of the coldest northern states and the drier parts of the South. It’s quite tolerant of soil types as long as it’s well drained and ideally a medium weight; waterlogged clay isn’t its favorite environment, although well drained clay should be fine. 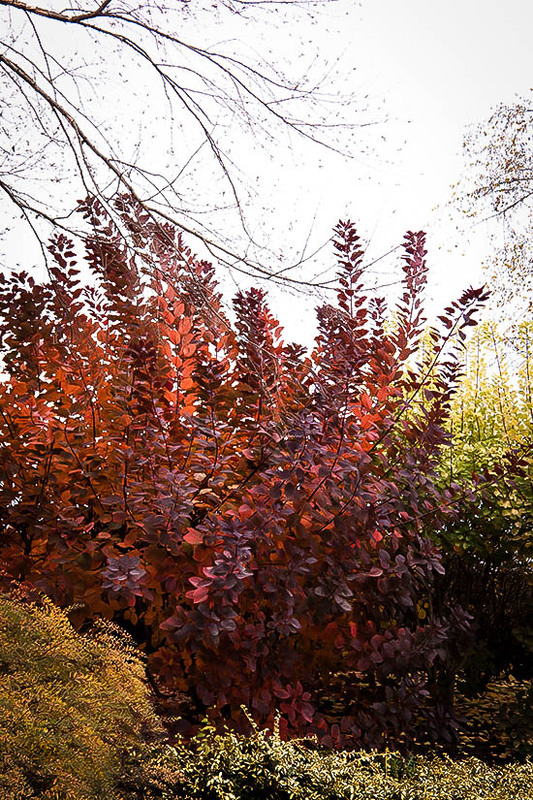 One useful feature is that it’s tolerant of infertile, rocky soil, so if there’s a rough patch where nothing else seems to thrive a Smoke Tree could do pretty well, as long as it’s not too wet. However the tree doesn’t like the shade much, and while it can survive it you’ll see much more impressive flowers and colors if you plant it in full sunlight. There are no serious insect or disease problems with this variety. Keep an eye out for leaf spot and rust, and beware of verticillium wilt – this usually shows up, unsurprisingly, as wilting of stems and leaves. Apart from that it’s fairly hardy. Because it tends to spread, you may want to do some pruning to maintain its shape or stop it reaching out too far; if this is necessary aim to do it in early spring, before new growth starts to appear; one benefit of this is that it will induce more vigorous regrowth with larger than normal leaves. However, excessive pruning, while good for foliage, is less so for the flowers; if you want to maintain the tree’s bloom – and we really think you should – keep pruning a slight as possible. The Grace Smoke Tree does need some maintenance, especially concerning drainage, but considering what it delivers in return it’s not a lot to ask. If you’re looking for a bright, striking accent tree this variety is ideal; it’s certainly guaranteed to turn heads, particularly in summer. Few other small trees provide such a long-lasting display so if you’re looking for a garden that’s eye-catching for as much of the year as possible, Grace almost certainly can find a good home in it. 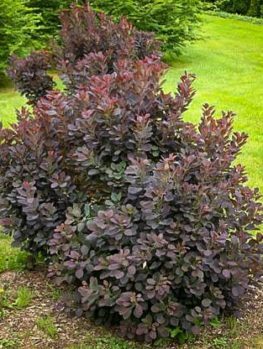 You may also want to consider planting other similar varieties, such as the Royal Purple Smoke Tree or the Velvet Cloak Smoke Tree.